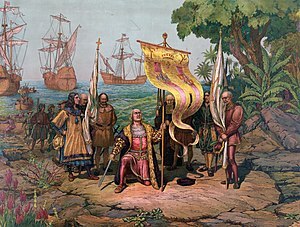 The Spaniards, led by Christopher Columbus, first came to the Americas in 1492. 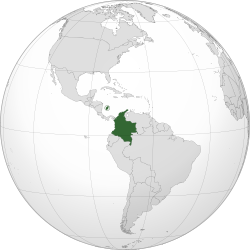 Columbus saw the coasts of Venezuela, Colombia and Panama and he gave them his own name. But Alonso de Ojeda was the first to explore the area of the Gulf of Darién. After that, the Spaniards founded the first European cities on the American continent: Santa Marta in 1525 and Cartagena de Indias in 1533. It was from Colombia that the Spaniards conquered the Incas of Peru. They founded the city of Popayán in 1536 and they conquered the Confederation of the Muiscas. In Bacatá, the capital of the Muiscas, the Spaniards founded the city of Santa Fe in 1538. In 1550 the Spaniards declared the territory as a colony and its capital was Santa Fe de Bogotá, but in the first decades it depended on Peru. Soon after, it was declared a Viceroyalty.